It's been a while since I've posted a new blog. Humble apologies tendered if considered necessary - possibly thanksgiving would be more in order from my followers - one less thing to read instead of writing? I've also been following up suggestions that I should read from Belfast Girls at the fringe events of two major local festivals, the John Hewitt Summer School in late July, and the Belfast Festival at Queen's in October. Still some work to do there, but sorted for the JHSS and nearly so for the Queen's festival. Just hope it actually sells some books! If you've read my previous posts, you know that this blog is about books I've read and liked, alternating between old favourites and new discoveries. You may also have realised that I read for pleasure, not instruction or moral development. Most of the books I read are funny, exciting, entertaining and full of good, mostly likeable characters. Preferably all of the above. However, occasionally I leap like a Jack-in-the-box out from cover, and read something not in my usual style. 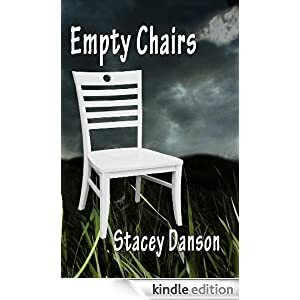 This happened when I came across Stacey Danson's Empty Chairs. Stacey, otherwise Suzannah Burke, is a writer I've known since Authonomy days. I admired her writing and was delighted when she interviewed me on her blog SooozSaysStuff and for her Snapshots of Success. More recently, when I won the Night Publishing Book of the Year Contest, she did a further interview with me for her AuthorsOnShow page. So when I heard that she herself had had a book published, back at the beginning of this year, I had to at least look at it, though fearing that it wouldn't be my sort of thing at all. Well, I was right. It wasn't. But from page one I was gripped, and I found myself reading the whole book with scarcely a pause. Jack jumps out of the box. This is Soooz's own story. From a childhood of unbelievable abuse on a regular basis, and from her mother of all people, through her escape to the streets and her meeting with a group of others in a similar predicament who were between them able to give her some of the love and support she'd been so badly missing, Soooz holds the reader enthralled. Episode after episode shocks and horrifies, but forces you to keep on turning the pages. Anti-gravity stuff - impossible to put down. Soooz is an excellent writer, and of course this is always important. Her style is smooth and in itself enjoyable. The story she tells is one which will probably bring the tears bursting out. It's hard to imagine a person who could read some of these things - the prostitutating of the three-year old girl by her own mother, for instance - without distress. In these days when true life stories have reached a never-before-seen level of popularity, this book will, I know, make an immediate appeal to a large number of readers. But if, like me, you normally avoid such stories, I would seriously advise you to make an exception here. The wisdom, courage, maturity and love which this writer achieved in her own character through her dreadful life experiences makes the book an encouragement, in the end, and I think you'll be glad to have got to know Soooz. She's a woman, and a writer, anyone should be proud to know. Another bit of news - if you read The Eye Of Erasmus, which I recently featured on this blog, you will be delighted to know that Teresa Geering has recently released Shasta Summer, a 'prequel' (awful word, but convenient). Shasta Summer was written, and is set, before The Eye of Erasmus, and I hear there's a third book in the series about to come sometime. I hope to write something more regularly from now on. See you soon, in a manner of speaking. Since my last blog post, things have moved on. I asked you all to vote for Belfast Girls on the Sinclair Books Book of the Month contest, and I want to thank the great number of people who did. I didn't win, but I came in second, which was very nice in itself - so thanks again, everybody! I've also discovered that I was among the twelve top selling books on Night Publishing for May - a very pleasant surprise! Developing my intention of alternating authors which are old favourites of mine with those I've come across quite recently, I come now to PG Wodehouse, master of English Literature, expert wordsmith and maker of phrases. It's been said of Wodehouse that his skill with words equals that of our best poets, an opinion with which I fully agree. 'There is none like him, none,' as he frequently quotes about one or other of his characters. Recently I've been re-reading my PG Wodehouse books. Since Wodehouse wrote nearly a hundred books, this is not something which you whizz through in a week or so. However, it is undoubtedly something which provides extraordinary pleasure, so as the actress said to the bishop, the longer it takes the better. It wasn't long before I'd bought other Wodehouse books, firstly, if memory serves me right, The Inimitable Jeeves, still one of my favourite books, especially The Great Sermon Handicap. Blandings Castle was another early purchase, and Uncle Fred in the Springtime. Over the years I'ver added to my collection, and now have most of them, I suppose. And what can I say about the Master? Like most people, I could easily be reduced to simply quoting his own felicities. I'll try not just to do that, but to talk instead about some of the things that make him great. Evelyn Waugh has said that Wodehouse 'has made a world for us to live in and delight in,' and undoubtedly the atmosphere of these books is one of the great pleasures of reading them. 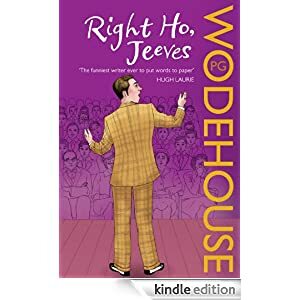 However, Wodehouse has created some marvellous characters who have become a part of our heritage, from Jeeves and Wooster, Lord Emsworth and his pig the Empress of Blandings, Uncle Fred ('Frederick Altamont Cornwallis Twistleton, Fifth Earl of good old Ickenham' as he often introduces himself), Psmith, Ukridge, and Bobbie Wickham, to name only the most obvious. There are also a number of characters who appear through many of the books, such as the American crooks, Dolly and Soapy Molloy, first seen in Sam the Sudden in 1925 and still on the scene in Ice in the Bedroom in 1961; Mr Cornelius the house agent from Valley Fields; Percy Pilbeam the slimy detective; the members of the Drones club (what a brilliant name!) such as Oofy Prosser; and a host of others. Lord Uffenham is one of my favourites among the lesser known characters. He appears in Money in the Bank and in Something Fishy, a book which I think demonstrates Wodehouse's skill with words almost more than any other. But there are so many amazing people. In addition to his excellent character drawing, Wodehouse's expert plotting has never been beaten. My own belief is that if a book is to hold our interest it must have a good plot as well as characters we can like and relate to. Wodehouse never lets us down in this area. His last published book, Aunts Aren't Gentleman, written when he was in his nineties, is just as accomplished as regards plot as his earlier ones, and the characters are still adding on layers of intricacy. Bertie's swim in the pool is sheer joy, to say nothing of the whole business of the cat. Wodehouse gives us situation comedy as well as a gazillion marvellous one liners. My own opinion is that it's in his short stories that Wodehouse really excels. All the best Bertie Wooster books are short stories. The same is true of Ukridge. Mr Mulliner is consistently entertaining, and so is the Oldest Member, and the Crumpet. It was after reading Wodehouse's golfing stories, told by the Oldest Member, that I borrowed my sister's hockey stick, laid out a course consisting of bricks on the rough grass behind our houses, and taught my young friends to play a version of golf which worked by hitting each brick in turn with a tennis ball propelled by the hockey stick. The game remained popular among us for the whole of one summer until my sister, getting ready for the new school term, indignantly reclaimed her hockey stick, and made sure I never succeeded in 'borrowing' it again. The Crumpet has been very under-rated as one of Wodehouse's narrators. The Amazing Hat Mystery, Uncle Fred Flits By, and a whole series of Freddy Widgeon stories are his, and he deserves full credit for them. The first two named are certainly among Wodehouse's best, although I also love the Ukridge story, told by Corky, A Bit of Luck for Mabel, and Company for Gertrude - where Lord Emsworth's swim in the lake and 'rescue' by 'Popjoy' is one of the funniest things I've ever read. Are you among the many Wodehouse fans? You're very sensible! Are you someone who hasn't read the Master as yet? Don't lose any more time in reading at least one of the books! And if you'd like to read my own book, Belfast Girls, you can buy it on Kindle for only £1.39 /$1.99. Or as a paperback for a little more.